ProximityHat is a wearable sensory substitution system, which uses pressure actuators around the head to convey spatial information. It was already shown that the sense of touch can be used to augment our perception of reality. Existing systems focus on vibration signals for information transfer, but this is unsuitable for constant stimulation in everyday use. Our system determines the distance to surrounding objects with ultrasonic sensors and maps this information to an inward pressure. 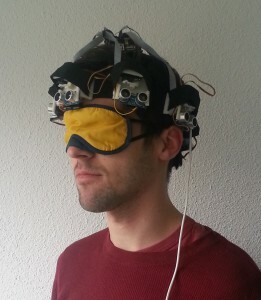 It was already evaluated in a study with 13 blindfolded subjects in orientation and navigation tasks. The users were able to discern at least three different absolute pressure levels with high certainty. Combined with the sensors, they could also use continuous values to navigate hallways and find doors. Most users had only a few collisions, but a small group of three individuals struggled more. We are studying these issues and plan to improve latency and wearability of the system.